The lamp doesn't work and you've tried everything. You've pulled out the bulb, checked it in another light fixture. The cord looks to be okay, unfrayed and whole. Then, if it's not the cord or the bulb, it's most likely going to be your socket. Most lamps can be broken down into: a body, a base where the cord enters, a harp support for the shade, and a socket. In the most simple of definitions, the socket is a device that takes in the cord at one end and the light bulb at the other. 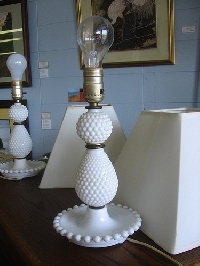 In certain instances, some lamps will have felt bases which it would be best to remove before the repair takes place. Simply use an utility knife to remove and replace with a helping dose of white glue after your repair is complete. There are four different types of sockets: chain switch, turn switch, push switch, and no switch. For our purposes -- despite the differences -- they can all be installed almost identically. Be sure to unplug the lamp from the wall. It could be a dangerous fix with electricity still flowing in, so just be sure the plug is out of the outlet. You may remove the harp if it's impeding you from changing out the old socket, as well. In most cases, you can insert a flat-head screwdriver between the base of the socket and the body to pull it up enough to work with the wires. You can also pull it apart into its separate components, which will be: socket shell, insulation cover, aluminum socket, and the base. For the socket base, there should be a screw holding it in place. Remove the screw and the socket base will come off as well. You can throw away the old socket base as it will be replaced by a new one. For this section, you may need pliers to get the old socket base completely off the lamp. That is, if it doesn't just come right off. You can cut the wires from the lamp and strip away at them to get rid of about a 1/4 of an inch to a full inch of insulation from each end off. Use wire strippers to accomplish this task. Then you can split the wires and insert them through your new socket base -- But be careful to do so without actually damaging anything. You will secure the new socket base with a screw at this point. Then, you can loosen the screws on the side of the new socket and wrap a wire around each separate screw. This section is more complex, with a variety of things you should know as you connect the wiring to the socket. For a more detailed look at the wires, screws, and what goes where, head over to a how to do things website for more information that will help to alleviate any concerns or questions on your part. After reviewing some of the intricacies of wiring in your new socket, you can move forward with the installation. A few pointers -- Wrap the wires clockwise around the screws, with the wire end underneath the screw. If you do it counterclockwise, the wires will actually spin off the screws as you tighten. And be sure to see that no parts have been damaged in the process. Tighten the screws, but not too tight. Snap everything back together. Reinstall the top of the lamp socket back down into the bottom section. Put on the harp, new light bulb, and shade. Plug back your lamp back into the outlet and click it on to see if your work has paid off with a working show of light.